I'm Back! I have missed reading everyone's blogs and can't wait to get back in the swing of writing. It's become very therapeutic and cathartic for me, and I love that friends and family can keep up easily this way! Keep your eyes open for a bunch of posts coming in the next day or so, as I try to get caught up on everything that is going on. 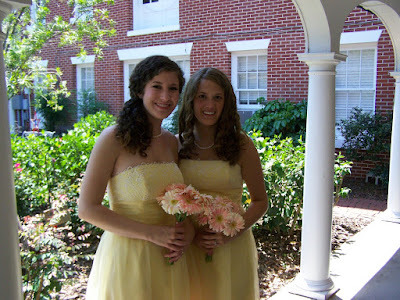 First up, let's start with my friend, Courtney's, wedding! I woke up, packed up, and drove to Orlando, Friday, May 8th, and kicked off the weekend with a series of beauty treatments! Eyebrows waxed, toes painted, and a hair appointment with a family friend. Since I have crazy curly hair, it needed to be tamed for the wedding, in case it decided to wake up on the crazy side that morning. She blow dried it, straightened it, and then curled it. I don't like my hair straight, so getting it back to "me" was most important! I went back to my in-laws house and my husbands cousins were there, hanging out for the weekend! That was pretty exciting, because I hadn't seen them since their wedding, in January. Two months ago I tried on my bridesmaid dress, only the zipper wouldn't go all the way up! No big deal, I thought, I just need to lose a few pounds. So Ian and I went on South Beach diet for the next 5-6 weeks, in order to slim down. Two days before the wedding, I tried on the dress again. Please imagine my shock when IT DID NOT ZIP! Ian trying to zip it, with a hysterically sobbing Brittney in the dress, and him nearly yanking the zipper clear off! I got on the phone with my best friend, Katie, and she let me know that the other girls' dresses were having the same problem. It was a zipper problem! Don't get me wrong, I'm really glad we did South Beach (and we still are, kinda,) because it taught me what kind of foods I don't really need to eat, and helped curb some serious craving problems, but.... COME ON! Right, so I went to Katie's house to hang out and have her mom look at the dress, and I ended up borrowing a dress for the rehearsal. Then, I headed out to the Bucks, to have coffee with my IRL(in real life,) and Blogging buddy, Olyvia! 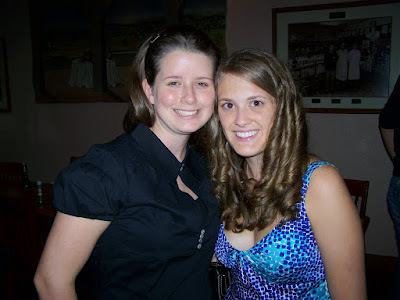 We took Elementary Literature together in the summer of 2007, and have tried to stay in touch ever since. After a quick caramel frap, I jetted back to Oviedo to get cleaned up, then Ian and I went to rehearsal and rehearsal dinner. They had their dinner at Carabbas and it was really special! The groom's parents put flowers on every table, along with framed pictures of the bride and groom, and there was a special table with the guest book, more pictures, and an album. Dinner was yummy and I had a great time hanging out with everyone! 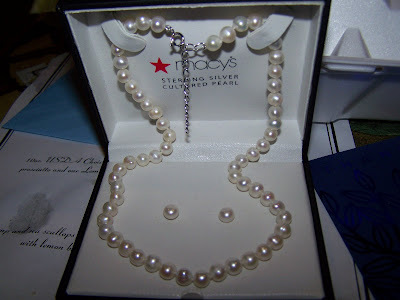 Our bridesmaid gift was a set of cultured pearl necklace/earrings! I also got a new favorite picture taken of Ian and I! That night, the girls crashed at Jessica's house and got up really early because we had to be at the bride's house at 7:30 in the morning! 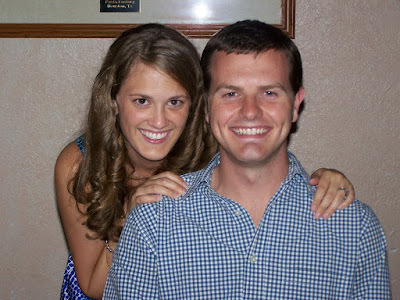 The wedding was gorgeous, the bride was beautiful, and everything went smoothly. Even our dresses zipped up (with three pairs of hands, that is!) and the reception was wonderful as well. By the time dancing started, I was plum exhausted (I knew I would be, sleeping with the girls and all!) and just sat back and took it in. I also started to stress thinking about all that was coming up, and it was good for me just to sit back! Those dresses are very pretty! It sounded like a very hectic, but very special and very wonderful time. Love the dresses! That yellow is beautiful! Your hair looks pretty as well! 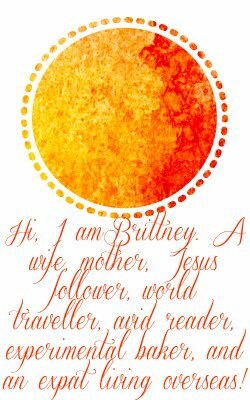 Yay Brittney! I saw that you had a blog from your facebook profile! I have been wanting to comment back to you on my blog but am not exactly sure yet how it works... Jarred and I are SOOOO thrilled your you and Ian! It is funny how we are pretty much going through the same process of moving right now to far away places (via Orlando I guess:) When are you guys leaving for good and how long are you going to be gone? Because hopefully we will be in Oviedo at the same time. And I give you all the credit in the world for being so busy lately and now moving in 2 weeks! I am stressed with 6!